I'm moving my long run to tomorrow since I'm working today, so in the meantime I thought I would update you all with my house progress! If you didn't know, hubs and I moved from Hong Kong six months ago to build our dream house in Georgia. 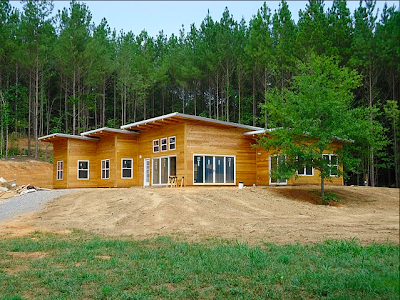 We came with the goal of building a modern and energy efficient home on our land. Well, a little bit of time later (and a lot of extra cash later) than we expected, but it's nearly done! I love this house! What makes it so special for me is that hubs designed the entire thing himself, from the layout to the materials to the roof heights. Truly one of a kind! The house itself is completely finished, painting, and air-conditioned (woo-hoo) but there's that small issue of furniture. Although at this point, I'm pretty ok with sleeping on the floor! 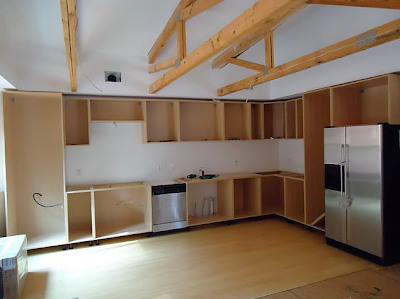 The countertops have been measured and will arrive in a week or so--I can't wait! We have a (completely unassembled and in boxes) couch and bed, so we're getting there. For some reason I have to wait to buy a treadmill until there are things like toilets and tables. Lame, I know. OBVIOUSLY I would rather run sheltered from the Georgia summer heat than eat off a table. Tomorrow I'm going to be sneaky and do a trial session at a local gym I have absolutely no intention of joining. I just want to run my 17 miles in air conditioning! Hopefully they don't think I'm crazy when I turn the "free trial" into a 3 hour run fest. Wish me luck--17 miles is my longest run ever! Have you ever used a gym's free trial before joining, or just because? I usually use the free trial even if I know I like it, to save a bit of money. There are a few gyms around me though, I might as well try them all out for free, right? What could you not live without, if you were getting ready to move into a new house? No bed? Ok, mattresses or sleeping bags will do. No oven? Sandwiches and salads are fine. Toilets? I draw the line at toilet people. That's gross. Your house is absolutely GORGEOUS. OMG. I can't believe your hubs designed the whole thing by himself!! That's amazing! Your house looks GORGEOUS! Love the style and can't wait to see more pictures soon! Ahhhhh!! Your home awesomely modern! Can't wait to see final product :) u prolly have said before, but when y'all moved to the US, how did u decide on georgia? It's beautiful! How exciting that it's SO close to being done! Great cross between natural and modern! Love it! Your house us gorgeous! Can't wait to see the finished product. Good luck in 17 miles tomorrow! Totally guilty of using trials for free gym time. But really, are there many people out there who need to "test" a treadmill before signing on? Gorgeous house, by the way! can't wait to see what your home looks like finished, it is adorable so far. your hubs looks like he has done an amazing job. when i was in college i somehow managed to try out almost every single gym in the city of chicago for free by using one week trial memberships, it was great. but now i am probably black listed from all of them! So nice for you both to be gettin so close to completion, and good luck on your 17-miler. I honestly cannot imagine running for 3 hours on a treadmill. yes, almost done! so prettttty!!! And we lived without a bed and microwave. Its like camping! This is so incredible. I'm proud of hubs and I don't even know the guy! Is he still blogging about the house or is he too busy actually building it? If so, what is the link? The house looks amazing! Good luck with your run and enjoy the A/C! I LOVE the house! Wow. It is SO unique! WHat a talented husband! I've tried one gym once with no intention of joining. Like you, I just wanted to workout inside that day and didn't have a membership at the time. Never went back! I ended up joining a way better gym! haha i need a toilet too. i lived without a microwave for a month and just baked everything that was frozen or needed heating up. I need running water and preferably a mattress. I sit on the floor way too often to think a couch is necessary though. Ah! So fun! I can't wait to see it finished! I do "trial runs" for things all the time... haha. When I was training for a marathon in the dead of winter in UT I totally went to two different gyms for trial memberships so I could run inside. I finally just bought a treadmill. I can't live without dental floss and a ton of other things. Thanks for commenting on my blog. Your home is so lovely. I look forward to following its progress. I love your house! It is absolutely stunning. The house is looking fantastic! I have a gym membership, but I'm always good for trying other ones ... why not! I can't wait to see your house when it's finished! I could not live without internet and my bed. Your house looks beautiful! That is so awesome you guys designed and built everything yourselves, I would love to build my dream house someday. I say you are a little tease. I want more pics of the house. It's so freaking awesome. Good luck with the run! You can do it fo sho! The gorgeous home, the work you've put in - and your loooong run. Wow, that is amazing! Very tasteful and well designed, I am so happy for you guys!!!! love your house. Also i use the free trials or special deals when i'm travelling, i generally just give the address of the person i'm visiting. I have no intention of joining but i need somewhere to sweat! The house looks amazing! WOW! You and your hubs have done an amazing job! I can't wait to see the complete finished product! The house is absolutely gorgeous. WOW! Your house is AMAZING! I'm totally blown away... I can't wait for a tour when you move in!! Whoa! Your house is seriously awesome! I can't wait to see more! I really admire this. So awesome. Wish my boyfriend or I had the talent or knowledge to pull this off. The house is looking great! So exciting!! The house looks amazing!! How cool!! I definitely could not live without a toilet either!! That and a comfy couch/chair to sit in! Love your house! Pretty cool and special since your husband did all of the designing! When do you get to move in? WOW!!! Looks great! Great Work! I love the house pics so far! Can't wait to see more. Keep us posted! I was supposed to use the trial membership and ended up getting talking into signing up. For me it was a wasted memebership because the gym was 20 minutes away and at the time I was working nights. It was hard for me to drag myself to a workout when I was so ready for bed. wow, that is a beautiful house! I can't wait to see the whole thing! Win A Bondi Band from This Girl! Soon We Will Be Three! So Good, You'll Lick the Bowl! Starbucks Ice Cream: 2 Ingredient Baked Alaska! 17 Miles and Parking Lot Sushi! New Orleans: The Sights and the Workouts! Why I'll Never Be a Model, Plus a Long Hike!